USA Network’s Mr. 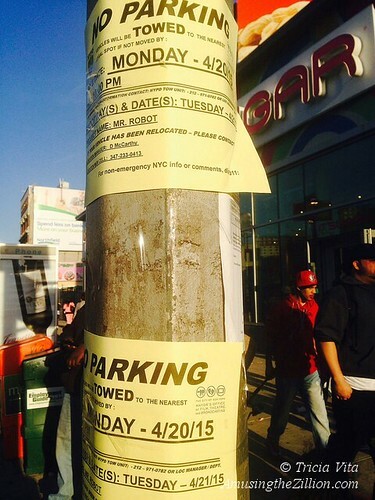 Robot, a hacker drama starring Christian Slater, which premieres on June 24, will be filming in Coney Island again on Tuesday. Casting notices say they’ll be shooting exteriors all day. Last October, scenes for the pilot were shot in Wonder Wheel Park. In the thrilling new trailer for the show, you’ll catch a glimpse of Slater riding in one of the Wheel’s cars with Elliot (Rami Malek), a cybersecurity engineer by day and vigilante hacker by night. Slater’s Mr. Robot is the mysterious leader of an underground hacker group trying to recruit Elliot to destroy the firm he is paid to protect. “What if you could set in motion the single biggest incident of wealth redistribution in history?” Slater asks him as they whirl in the sky over Coney Island. Last Month, Mr. Robot won the SXSW Audience Award. On April 26, the Tribeca Film Festival will have an advance screening of the pilot episode. I saw the same notices yesterday by the Bowery and Stillwell. I did do a search on IMDB.com on the title and found the same info about what you wrote about. I thought it was a once and done movie title. Didn’t sound like it had anything to do with amusements or Coney Island. Sometimes movie projects don’t have their real names used in projects like this. I thought this was the case here. Yes, Mr. Robot is indeed the name of the show, 10 episodes were ordered, and it premieres in June! Some scenes in the pilot, including the meeting of the two protagonists, were filmed in Coney Island in October. It reminds me of the crucial scene in the Blacklist where Red meets Berlin on the boardwalk, against the backdrop of the Wonder Wheel. Secret meetings in a crowded place! But I wasn’t inferring that the plot of the series had to do with Coney.